South African ace Richard Levi has signed a new two-year deal at Northants. The contract will keep the 29-year-old at the County Ground until the end of the 2019 season. Levi has made 28 first-class appearances since joining the club in 2013, scoring 1,468 runs including nine fifties and two hundreds. Initially, Levi joined as the overseas signing for the T20 competition and made an immediate impact, winning the FriendsLife T20 with the Steelbacks under skipper Alex Wakely. He then returned to Northants in 2014 with the intention of playing purely white-ball matches, though injuries to a number of the Northants squad meant he also played four first-class matches for the club. Levi has played an instrumental role for Northants in the T20 competition, playing 53 games and scoring an impressive 1,397 runs over four seasons - winning two trophies, including the NatWest T20 Blast in 2016. He has also been a regular performer in List A cricket, scoring 799 runs in 24 matches, with a top score of 109. Despite Northants being knocked out of this year’s Royal London One-Day Cup, Levi has had an impressive campaign, scoring 305 runs across seven games at an average of 61, including three fifties and one hundred. 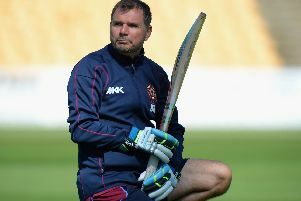 And Northants head coach David Ripley said: “He’s been in good touch this season. “He is an outstanding white-ball batsman with plenty of invaluable experience. Levi is delighted to be staying at Northants for another two years. And he said: “I’m very privileged to have the opportunity to play for and represent Northamptonshire and I’m delighted to be extending my contract with the club. “I’ve had a great five years here, we’ve got a great bunch of guys in that changing room and they’re an absolute pleasure to play with.